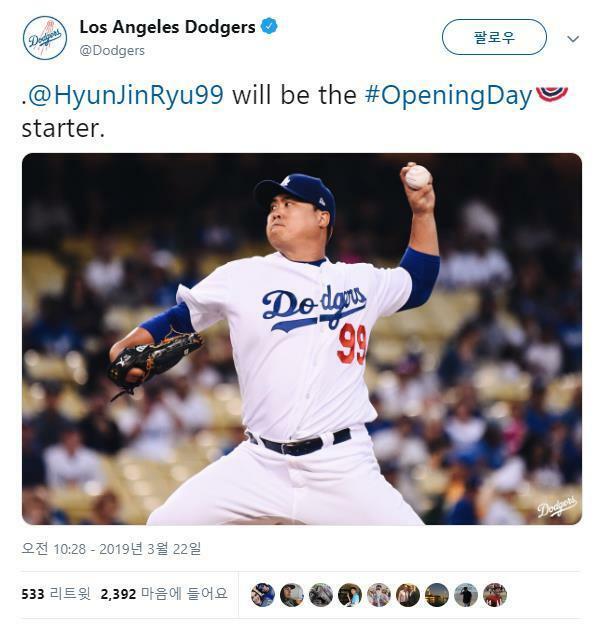 Los Angeles Dodgers’ South Korean left-hander Ryu Hyun-jin has been named the team‘s Opening Day starter, becoming just the second pitcher from the country to have the honor. Manager Dave Roberts made the announcement in the Dodgers’ spring training site in Glendale, Arizona, on Friday (local time). Injuries to Clayton Kershaw, who had opened the previous eight seasons, plus Walker Buehler and Rich Hill left Ryu as the most viable option to start the season against the Arizona Diamondbacks next Thursday at Dodger Stadium. Ryu, 31, is the second South Korean pitcher to make an Opening Day start in Major League Baseball (MLB). Park Chan-ho became the first to do so when he took the mound for the Dodgers in 2001 against the Milwaukee Brewers. In 2002, Park signed with the Texas Rangers as a free agent and got the Opening Day nod again against the Oakland Athletics. Ryu made five starts in spring training, recording a 3.00 ERA with 12 strikeouts against no walks in 15 innings. 2016 following shoulder and elbow surgeries. Last year, he was 7-3 with a 1.97 ERA in 15 starts and missed three months with a groin injury. He made three starts against the D-backs in 2018, going 0-0 with a 3.75 ERA. The lefty was 5-2 with a 1.15 ERA in nine appearances at home.